Posted on June 10, 2018 June 10, 2018 by SherylPosted in FoodTagged eggs, recipe. It sounds good ….. if hardly calorie-free! Oh wow, that looks divine. It is a change from the standard ways of serving eggs. Oh, sounds yummy! This would be the only thing I could eat that day…inevitably rich in calories, but will try when my son & family come to visit. 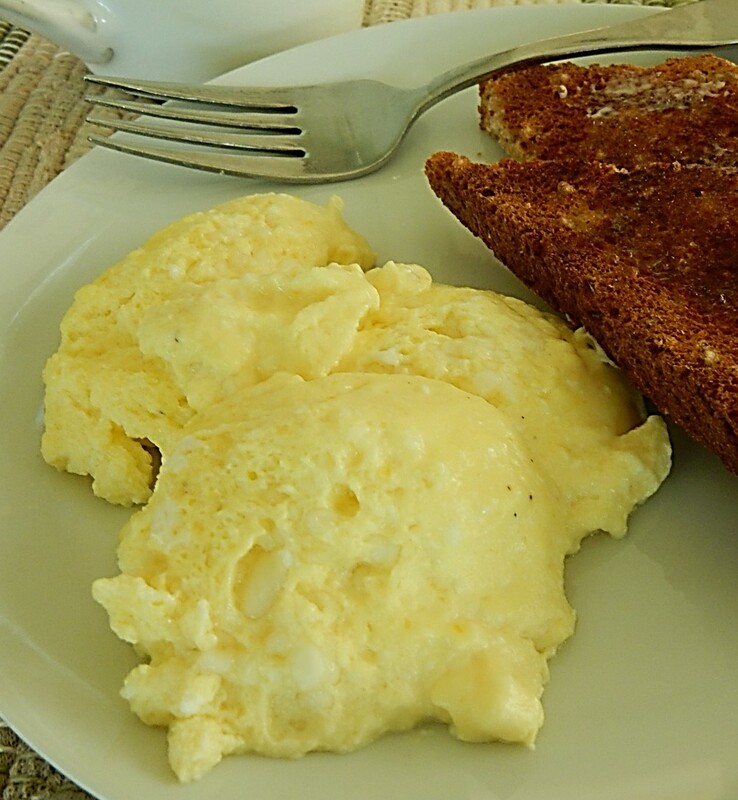 If you like to try new ways of serving eggs, I think that you will enjoy this recipe. I think if this recipe was started now it would involve the microwave . . . . It sounds great. I’m appalled by the cream cheese AND cream components as it makes it not only super high in calories, but super lactosey by virture of the cream. BUT it sounds so good I already printed it to make hahahaha. Now that you mention it, I think that you are absolutely right. A cook today trying to figure out an easy way to make a recipe using just one dish (and some stirring) would think about how to make it using a microwave. You are right about cooking eggs four times a month. I probably have you beat though as we have breakfast for dinner a lot. It’s my go-to meal when I tint feel like cooking. When I finally got H to switch to scrambled or poached instead of fried I was overjoyed! That’s a lot of eggs for two people but I may have to try it. I wonder if I could halve this? Sure, I think that you could halve the recipe. (It might require an assumption to divide 5 eggs by 2 – but I think that I’d just assume that my eggs were a little on the small side and use 3 eggs). Eggs are a good go-to meal. They are so nutritious. Omg this sounds amazing! I have never heard of putting cream cheese in the eggs! It’s fascinating to see some of the ingredient combinations in old recipes. And, the wonderful thing is that the combinations that seem a little unusual, often end up being very tasty. This is unique and sounds like one I’d love to try out!! It’s a nice variation on the usual egg dishes. I would serve this if royalty came to my house for breakfast. It sounds marvelous. Actually, some of the royals I’ve read about eat simple, unexciting food. I didn’t think about what they would want to eat. Even though the recipe name suggests that Southern Golden Fleece should be very fluffy, my impression was that, rather than a fluffy texture, that it had a very smooth texture. This would be a great dish to serve when the family all comes home! Save on using several frying pans . It definitely was nice to not have to wash lots of dishes and pans when I made this. That does sound good! I’ve tried them with cottage cheese mixed in, but never cream cheese. Thanks for the recipe! Cottage cheese sounds good, too. I’m now curious about how one warms crackers in the oven, and will give it a whirl one of these days when I have the oven heated up for something else. I’ve never seen that instruction in a recipe anywhere! I’ve never seen directions like this either. Maybe if the crackers were a little stale, this would crisp them right up. Sounds good. I’m going to try this next week. I think that you’ll have fun with this recipe. I particularly enjoyed how Southern Golden Fleece was made using just one dish. The name and recipe sound magical. Looks fluffy and yummy! I think that the name is my very favorite part of this recipe.